Henry our guide from Alpaca Expeditions meets us at our hotel in Cusco for our Lares trek briefing the night before. It is a private trek with only the two of us. We are not trekking to Machu Picchu so will do the typical Lares trek in reverse. This way the trek ends at the Hot Springs in Lares. We did Machu Picchu and Lares 10 years ago but it is Lares that has brought us back to Peru. 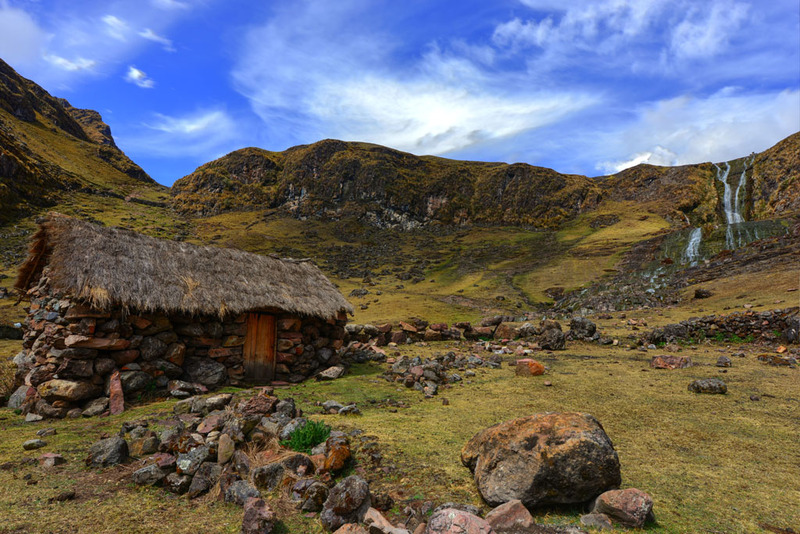 Lares is off the beaten path, and the culture, scenery and serenity cannot be compared to the crowded Machu Picchu trek. Henry gives us a map and explains our route and routine. He tells us how far and how high of altitude the trek is during the next three days. His talk about snowy peaks, turquoise lakes and Llamas makes us excited and later we can’t sleep! The trek starts from the village of Huaran which is 2700 metres high. 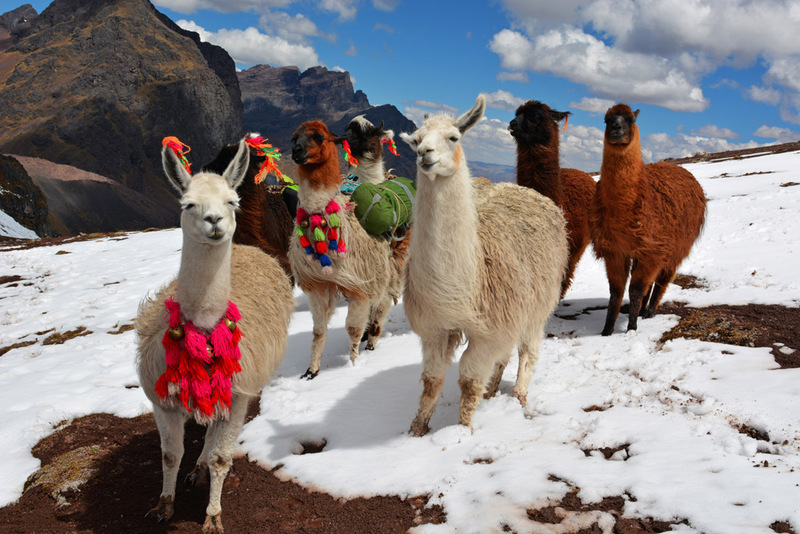 Here we meet the rest of our team from Alpaca Expeditions. Wilbur our cook and his assistant Samuel shop at the market for fresh fruit and vegetables for the trek. 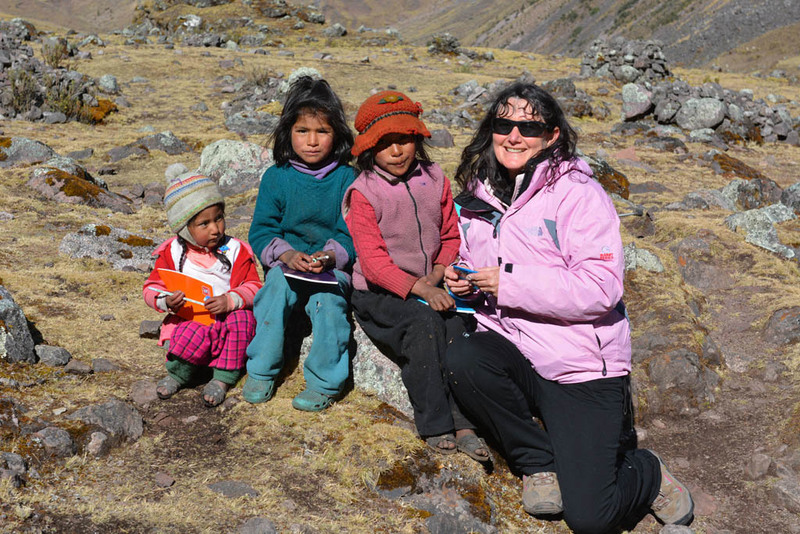 We buy books, pens and colouring pencils for the school children and bread for the families who live on the Lares trek. Tornado the emergency horse. 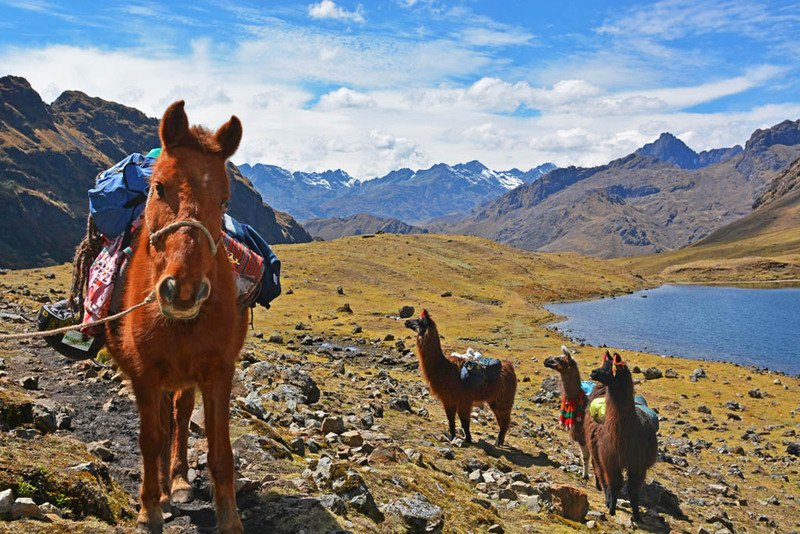 Alpaca Expeditions have an emergency horse on all their treks in cases of an emergency. Wilbur and Samuel prepare our first delicious breakfast as everyone gets prepared. Horses and colourfully decorated llamas wait patiently around to be packed with light bundles. Pablo our horseman and Leandro our llamero come from the Quiswarani village and they have travelled with their horses and llamas all through the night to join us. Among the horses is Tornado the emergency horse who carries the oxygen and stays with trekkers at all times in case of an emergency. The original plan was for us to have four llamas but they get upset when separated from their herd. So much to our delight, the complete herd turns up! 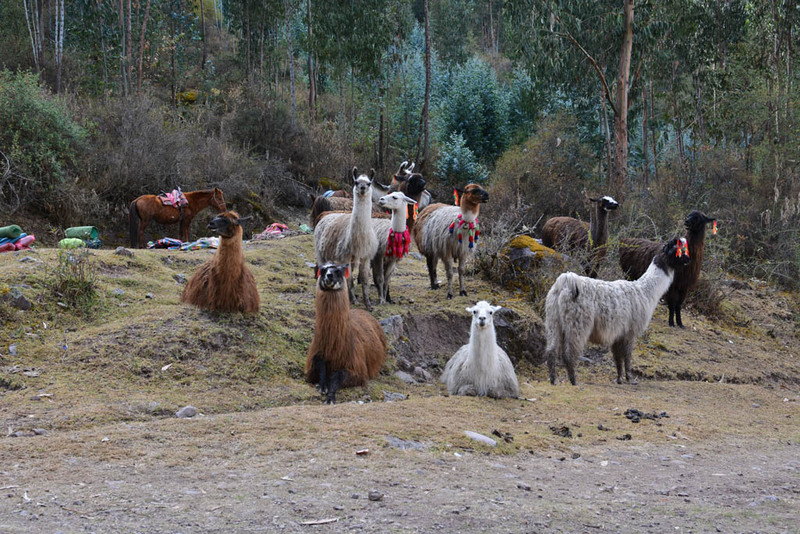 Llamas and horses wait around while we prepare for the trek. Our personal gear is carried by the team and we also employ two porters, Adolpha and Stanis Lo from the local village to carry our camera bags and water. This lets us concentrate on the trek and also gives work to the locals. 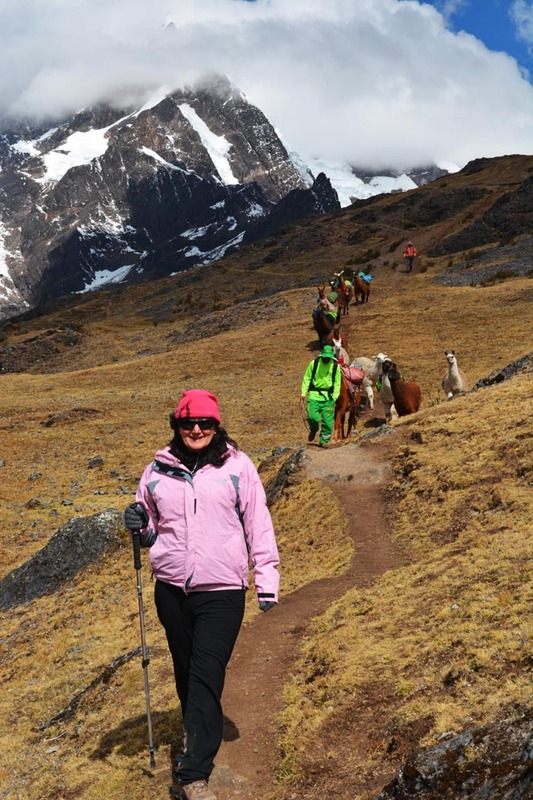 We trek about 9 km alongside the Cancha Cancha River, steadily making our way uphill to our first camp in the village of Cancha Cancha, which is at an altitude of 3750 metres. Henry, Adolpha and Stanis Lo walk at our pace and the rest of the team go ahead. On arrival at the village in the afternoon, our tent and flush toilet are set up, coca tea is made and warm water ready for washing and refreshing. Over dinner, Henry chats to us about the day’s events and tomorrow’s 14 km trek. It will take us over Condor Pass, at 4680 metres it is the highest pass on our trek. Henry reassures us that we will take it slow and steady. The meals are delicious and beautifully prepared, and there is no way we can finish the huge portions. Before we retire to our tent for the night Samuel makes mugs of hot chocolate which helps to keep us warm and hydrated. It is freezing cold here and at less than -4°C, it is the coldest camp on our trek. When I snuggle up in my sleeping bag I keep my gloves and beanie on as it’s so cold. The snow starts falling as we drift off to sleep, too tired to even think about tomorrow’s trek over the high pass. Warm water for washing and hot coca tea is delivered to our tent at 6.00 am. 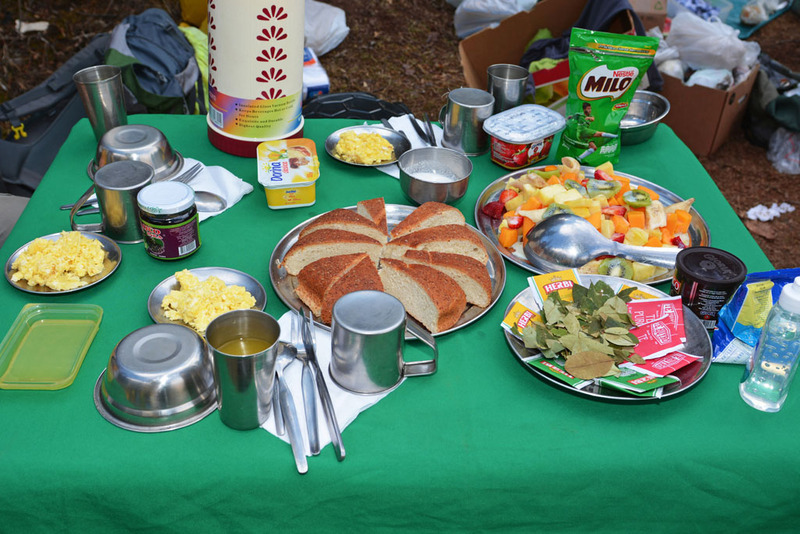 In the dining tent, scrambled eggs, toast, fruit, tea and coffee are served. Within half an hour after breakfast, the team, horses and llamas are all packed up and ready. As we walk through the village of thatched stone houses, we hand out books and pens to the children and bread to the adults. Wrapped up in our thermals, boots, gloves and beanies we notice the children’s feet in thin open sandals. It’s a beautiful but harsh landscape and life is tough here. 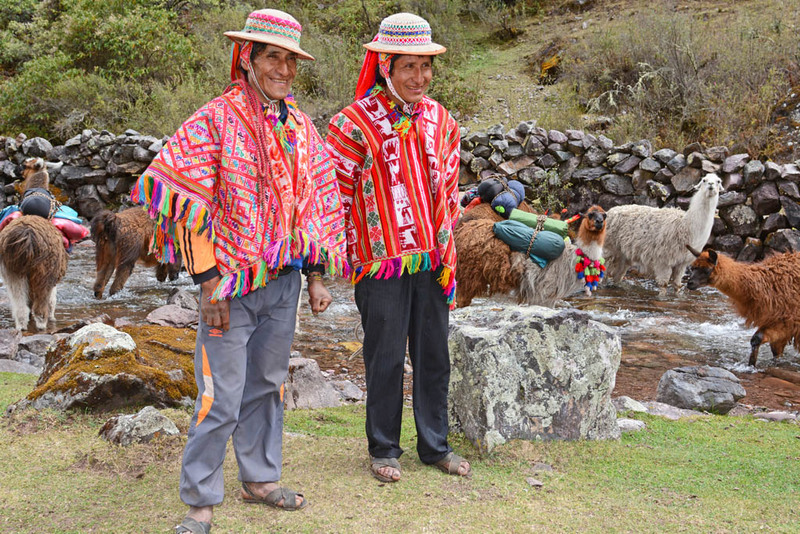 These authentic villages practice the Incas lifestyle and speak Quechua, the language of the Incas. It begins to get challenging about half way to the pass and we feel the altitude. The path is steep, snowy and muddy. I can hear my heartbeat thumping loudly and Ray’s breathing behind me. Henry tells us we are doing great and encourages us to stop regularly for a rest and sips of water. Ray has a watch that gives a reading on the altitude and I ask him how high the altitude is. I am pathetically disillusioned when he replies we are only at 4100 metres. That means there is still 580 metres to go. I am so hopeful that the watch is wrong and malfunctioning. Celebrating at Condor Pass with the best team. Adolpha, Stanis Lo, Sue, Ray and Leandro. We overtake the only other trekkers on the path which gives us some more confidence and a burst of energy as the snowy peak beckons us. 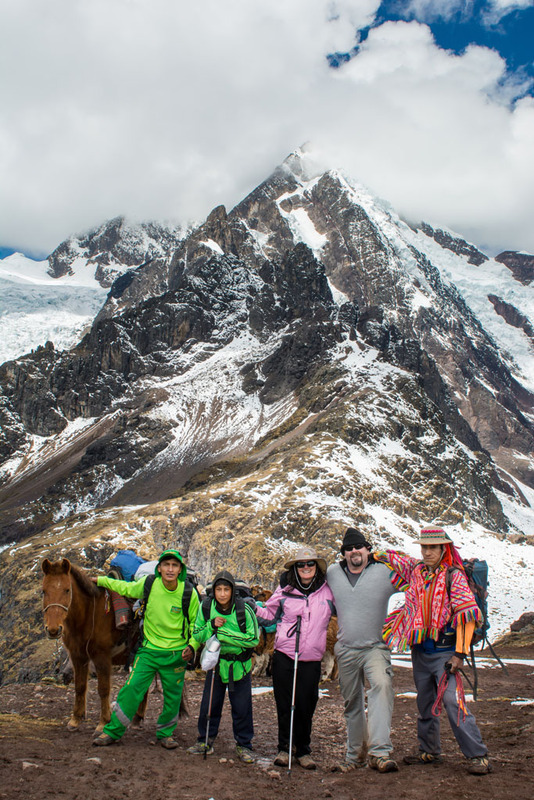 It is not long before we celebrate and share the highest point in front of the majestic mountain of Pitusiray which is 5700 metres and one of the most spectacular, serene and heaven-like views in the Andean Mountains. On a high after our achievement, we make our way down to the waiting team who has set the dining tent up near a blue lagoon. It amazes us how Wilbur and Samual can cook up a storm because they only have this little space sectioned off in the dining tent. They cook with only a gas burner, a few local ingredients and a couple of pots and pans! Breakfasts are a choice of eggs, pancakes, bread, quinoa and fruits such as avocados, pineapple and yoghurts. Lunch and dinner are always four courses, starting off with a fresh and creamy vegetable soup. Not to mention crackling hot popcorn for happy hour in the afternoons. On our last night, they even bake us a delectable carrot cake! We have time to rest and relax after lunch, before the short trek to Quiswarani village where our camp is for the night. For the second night in a row, we retire to our tent in sheer exhaustion. We camp near a lake at Quiswarani Village. Today the walk is 12 km and over the Quiswarani Pass, which is at an altitude of 4350 metres. We pass rosy-cheeked children walking the paths near the village on their way to school and locals from the villagers who care and herd their goats, sheep, llamas and alpacas. Because we are acclimatising to the altitude we make the pass in good time today. It is nowhere near as difficult as the trek to the Condor Pass on the previous day, though it did require a lot of effort! The contrast of the snowy mountain peaks, blue lakes and waterfalls against the harsh brown landscape is dreamlike. It is adorable to see the bums of our llamas as they look out at the view and cross the pass. The llamas and horses need to move through swiftly because it is a narrow path and the slightest misstep could cause a fall. 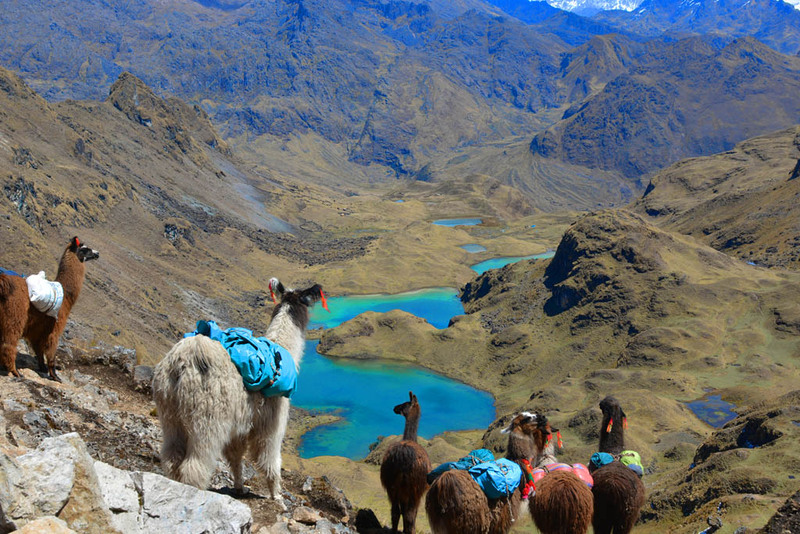 Llamas look out over the view on Lares Trek. 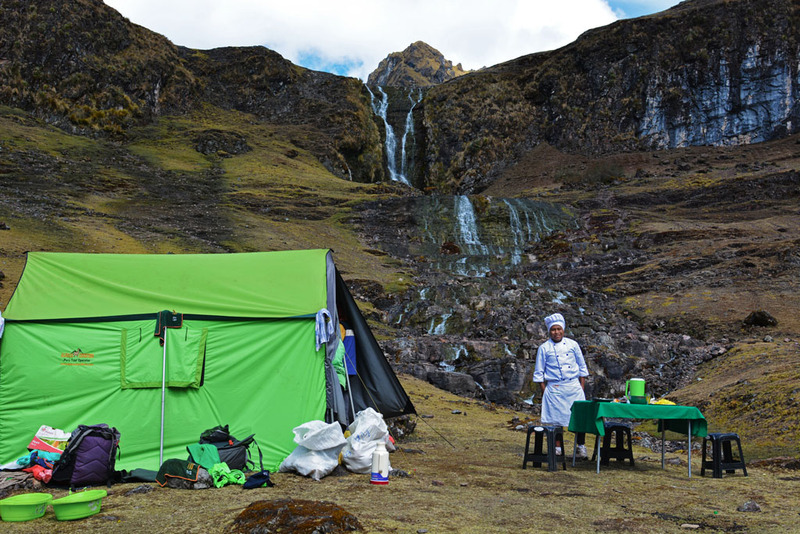 The views of Lares Valley on the way down are spectacular and from the path, we see some of the team who have gone ahead to set up the dining tent in the distance near another blue lake. Our stomachs grumble and we can’t wait to get there! After lunch, Henry tells us because we have made such good time we can do a few extra kilometres and camp at the hot springs in Lares for the night. This is tempting to everyone as the itinerary has us camping in the village of Cucani and trekking to the hot springs in the morning. Soaking in the hot springs for the night makes us all enthused and everyone quickens their pace. We trek the extra 8 km following the river valley and arrive at the open-air thermal springs just on dark. As soon as we arrive we shower and relax in the hot springs. To step from the icy air into the warm and steaming water is pure ecstasy and muscle aches feel instant relief. Later the aroma of Wilbur’s cooking drifts down and entices us out and it is a mood of celebration as we have a few drinks and shout sodas and beers for the team. 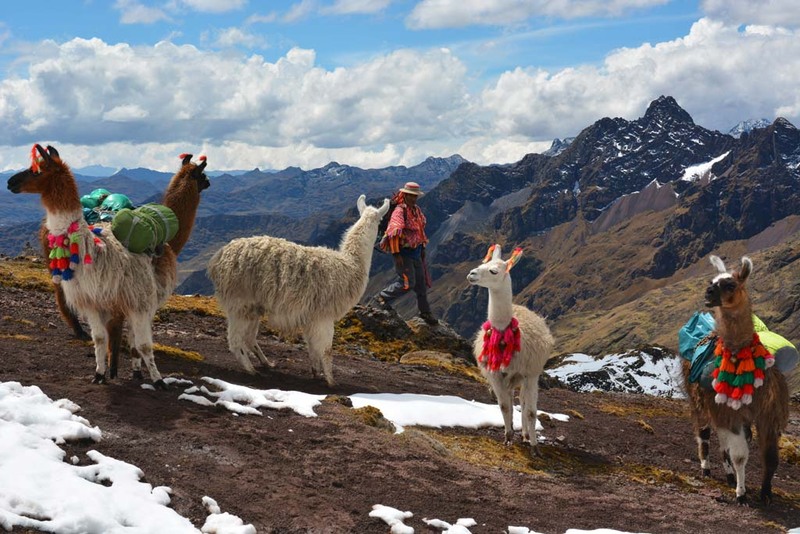 We do Lares trek privately with Alpaca Expeditions a local company who put back into the community. 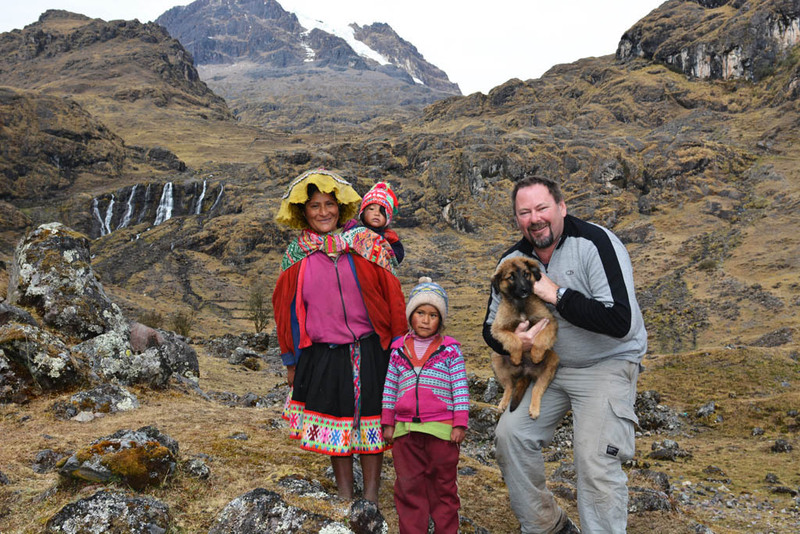 Their many social projects in Peru include improving the living conditions of the locals and children in the villages on the Lares trek. 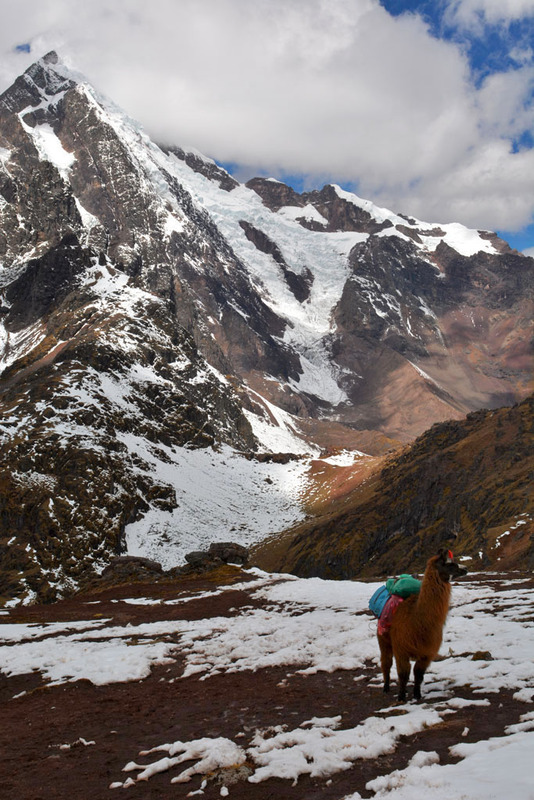 They treat their porters and the rest of their staff the best in Peru and supply the right equipment, wages and medical insurance to all of the team. Their guides are the best. Henry kept our spirits high when the trek got challenging and showed nothing but patience, support and a sense of humour. He was very perceptive to what we wanted from the trip. He explained the local customs and treated everyone on the trek with respect. Thank you, Henry! The best Alpaca Expeditions team! Henry, Leandro, Adolpha and Stanis Lo. Spectacular photos, as usual! The Tornado horse is so beautiful, and the Llamas is adorable. 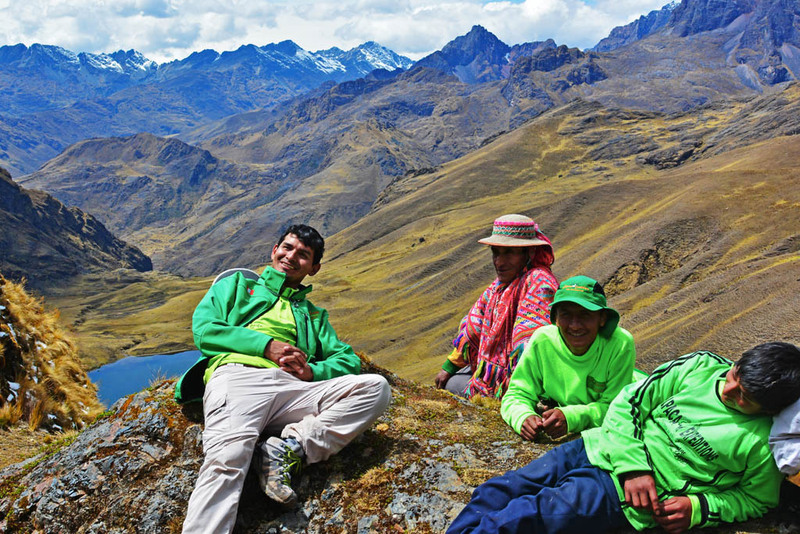 I observed you capture photos with full creativity from Lares Trek. Thank you for sharing your marvelous photos of such a gorgeous area with its equally gorgeous wildlife. Thanks for your comments once again Karan. Lares is a spectacular place and well worth visiting. 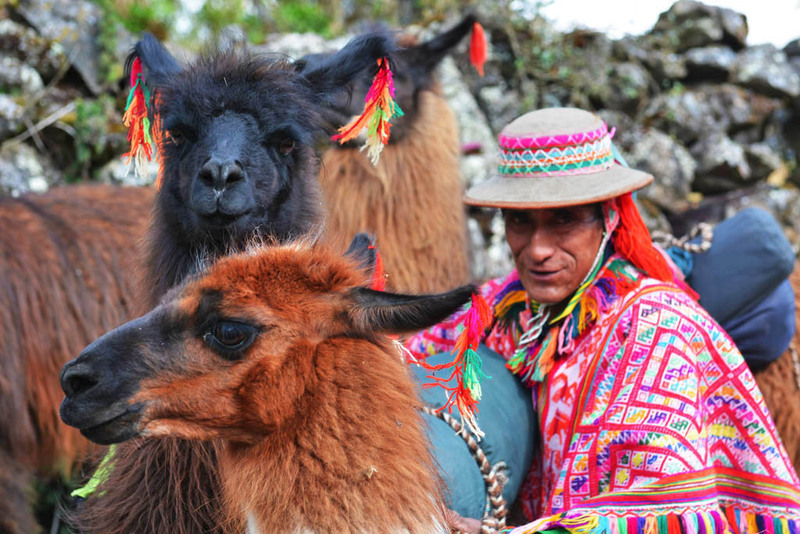 My heart is racing…we will be leaving a week from today to start our Tour with Alpaca Expeditions… 4 days in Cusco and environs to help acclimate..then Later Trek. Thank you for the best preview!!! We can’t wait!! Hi Barbara. You will absolutely love it! Also just letting you know that generally the llamas are not standard on the treks. They are an extra that you need to request. We look forward to hearing about your trip!! Hi…. 🙂 Bonnie mentioned that 🙂 …. CAN’T WAIT! Thanks for your comments Natasha. The llamas aren’t used for riding. They carry small packs only. But yes they are very cute and all with their own personalities. They just adored Leandro their owner and were worried whenever he was out of their sight. They really topped off, what was a fantastic trek! Amazing photos as always. Your images are what true photography is all about. We know you guys have trekked Machu Picchu before so would you recommend people do that? Also Lares looks like you need to be pretty fit. Can you give us some more info on that? Thanks for your comments Steve and Louis. An amazing place to photograph! There are about 500 people trekking Machu Picchu every day, so it can be very crowded. 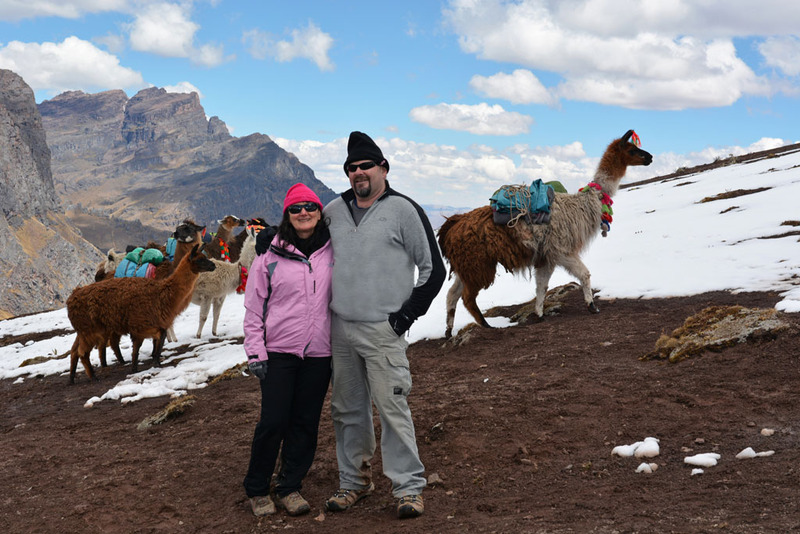 We spoke to people who were disappointed they did Machu Picchu and said if only they knew about Lares Trek. On the other hand, many people have told us they loved the Machu Picchu trek – the people the crowds and the atmosphere. 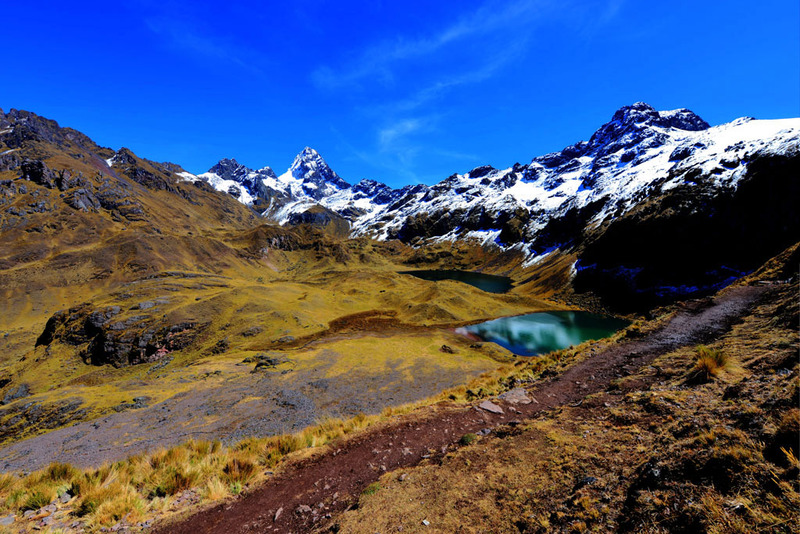 If trekking Lares, you will more than likely have it to yourself and the scenery is spectacular and the culture amazing. If you have average fitness, you should be fine on the trek. We both walk every day for about 60 mins – 90 mins. We didn’t train extensively or walk up mountains beforehand. The key is to acclimatise and take it steady. Just fantastic these are my favourite mountain scenes every thing looks sparkling fresh. The photos of the Llamas to me is so magical what real photos no posing just like all your others. You both capture every thing so good and your words put it all together. I want to go there. Thanks, Noela. 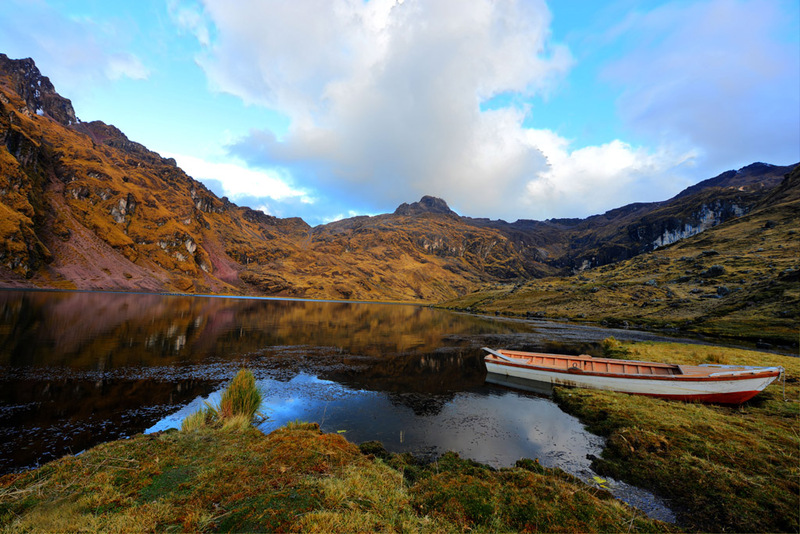 Lares is beautiful, so pristine and untouched. The Llamas really topped the whole experience off. This is one trek to put on your list! Their are no words to describe such amazing photos thank you once again,for taking us into your world and allowing us to dream .maybe in my next lifetime. Hi, Sue. Being in an amazing place helps to get these photos. We hope you make it here one day. It really is beautiful. Thanks so much for your comment. Just fantastic!! Makes me want to go now. The passion for the places you go come out through your writing. Thank you for taking me there. 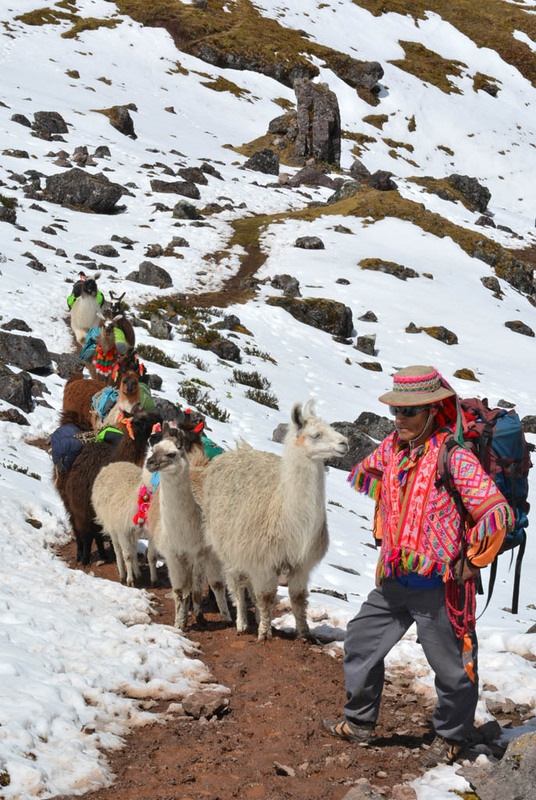 The Lares trek to MP is one of the alternative routes to the famous Inca trail. people book 5 to 6 months in advance and olny a certain amount of passes are availableeach day. As you do not want to restrict yourselfs to a date, you can opt for the alternative one. 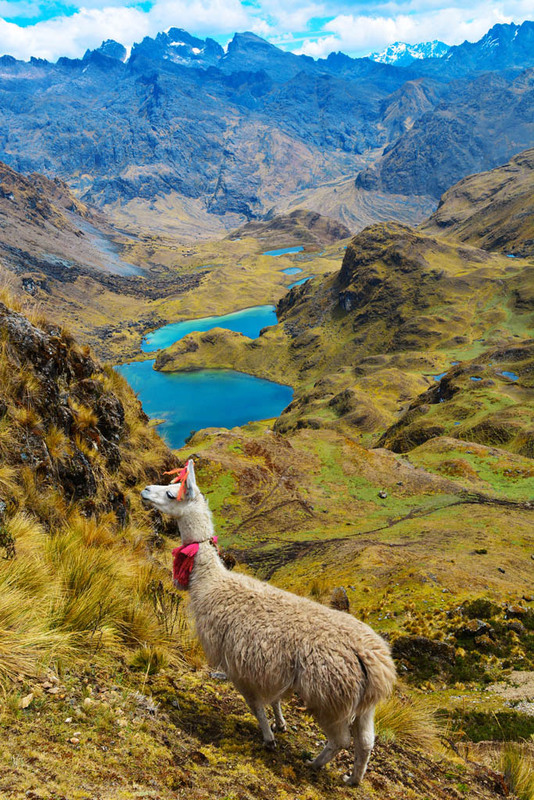 This amazing Lares trek is off the beaten path that goes through the peruvian Andes with stunning valleys, native comunities, and the hike ends in a beatiful hot springs.